Matt Adeletti, the new acquisition manager for Pitkin County Open Space and Trails, found a perfect fit for his lifestyle and interests when he moved to the Roaring Fork Valley. If someone tells you that Matt Adeletti is a man of many talents, believe them. Adeletti is the new acquisition manager for Pitkin County Open Space and Trails after spending 12 years in Boulder County as a paralegal for its Parks and Open Space Department. Besides being a paralegal, he’s an accomplished cook, snowboarder, climber, mountain biker, rafter and skier, which is handy when you live in the Roaring Fork Valley. He’s also learning to fly-fish and has hiked almost every fourteener in Colorado. He was a certified emergency medical technician, loves to paint and is a certified scuba diver. Originally from East Longmeadow, a small town outside of Springfield, Mass., Adeletti attended American International College in Springfield and earned his Bachelor of Arts while majoring in English. While in college, he met a woman from Colorado who told him about the outdoor lifestyle that many enjoy here. Lured by the skiing, hiking and rock climbing, Adeletti packed up his Mustang and fell in love with Colorado immediately. He moved to Boulder and worked seven years for Ohmeda, a company that produced medical devices. In 1997, like it had many times in his life, the urge to try something different kicked in. Adeletti was interested in law and has a brother who is an attorney, but he didn’t want to drop $70,000 in school costs to become a lawyer. He attended the Denver Paralegal Institute and earned his paralegal certificate. 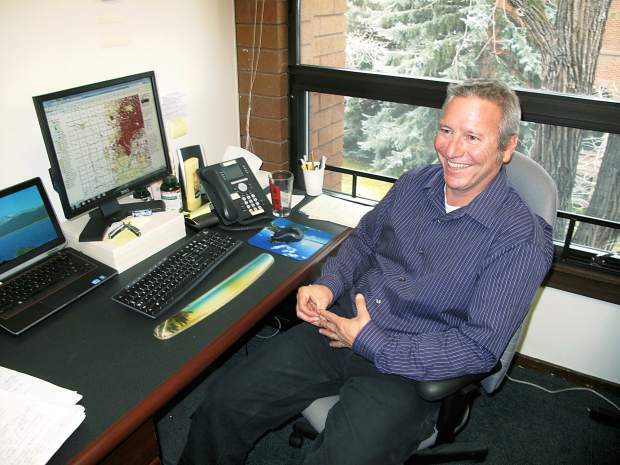 He worked for the Land Title Guarantee Co. as a title researcher for three years before becoming a paralegal in 2001 for the Boulder County Parks and Open Space Department, a job he kept until September 2013. There, he accomplished the due diligence necessary to acquire real property rights for open space purchases, working with landowners interested in preserving their property through the open space program. In Boulder, the Parks and Open Space Department has two attorneys, four paralegals and four land officers dedicated to acquiring land for open space. He also was forced to become knowledgeable about oil and gas production, as Boulder County has more than 130 producing oil and gas wells on open space properties within the county. Because of the complexities involving open space lands with oil leases and mining claims on the properties, Adeletti expanded his knowledge base into property law. But after 12 years working for Boulder County, the urge to try something new hit again. It seemed every time Adeletti visited Glenwood Springs or Carbondale to hike or climb, he would say to himself that he needed to get a job in the Roaring Fork Valley. In September at a conference, he met Dale Will, executive director of Pitkin County Open Space and Trails. Will told him about an opening for an acquisition manager in Pitkin County, and Adeletti saw his next opportunity to try something new. Two weeks later, he accepted the offer to take the job. While Adeletti admits he had a great job in Boulder, he says his new gig is even better. Becoming an acquisition manager is a move up in his career and carries more responsibilities than his position in Boulder. On top of everything, there’s the benefit of living in the Roaring Fork Valley.